The only item of fundamental news on the economic calendar for the Japanese Yen was released in the overnight trading session by the Ministry of Finance who reported that Japan’s exports in the Trade Balance figures continued to fall in March from a year earlier and were in fact down by 46% year on year, although the rate of fall has slowed slightly suggesting that the economic slump is perhaps easing. The figures released were better than expected at -0.1 trillion against a previous of -0.25 trillion and provided a small boost to the Japanese Yen. 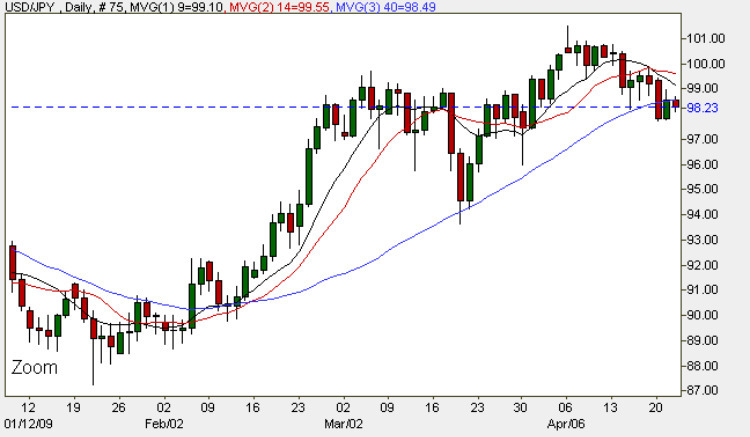 Although yesterday’s candle closed the session on an up bar the close of the day failed to hold above the 40 day moving average suggesting that any move higher seems unlikely and indeed this picture has been confirmed in early trading this morning with the dollar yen pair moving lower back into the heavy congestion area created throughout March, and as suggested yesterday we are likely to see this picture continue for some time. The only other fundamental news relevant to this pair are the crude oil inventory figures, HPI data, and a speech by Treasury Sec Geithner all of which I have covered in more detail on the eurodollar site. My trading suggestion for today is the same as yesterday, and continue to look for small short positions on the 15 and 30 minute chart with tight stop losses and small profit targets.